“Nature?” Marta de Menezes, Live Butterfly with modified wing pattern (1998-2006). 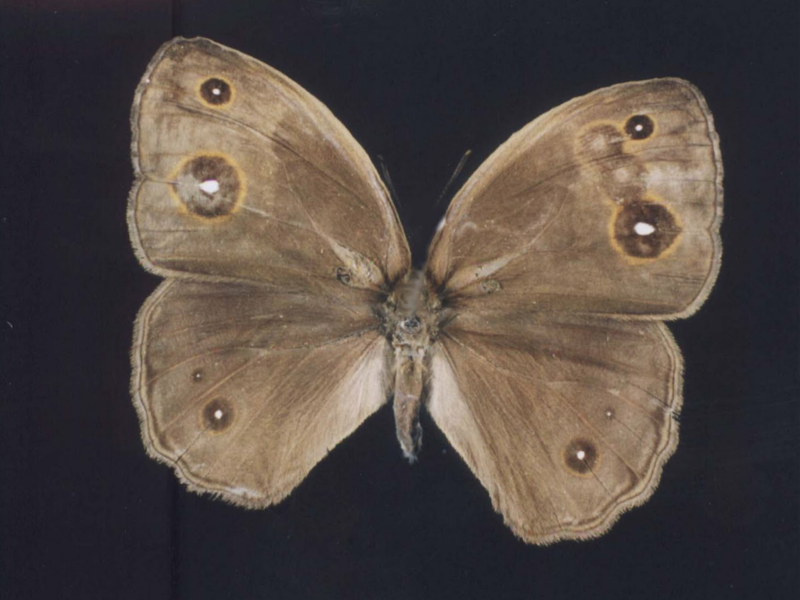 In “Nature?” Mara de Menezes created live butterflies where their wing patterns were modified for artistic purposes. Such changes were achieved by interfering with the normal development of the wing, inducing the development of a new pattern never seen before in nature. Bio: Marta de Menezes has been exploring the intersection between Art and Biology, working in research laboratories demonstrating that new biological technologies can be used as a new art medium. In 1999, de Menezes created her first biological artwork (Nature?) by modifying the wing patterns of live butterflies. Since then, she has used diverse biological techniques including fluorescent DNA probes to create micro-sculptures in human cell nuclei (nucleArt, 2002); sculptures made of proteins (Proteic Portrait, 2002-2007), DNA (Innercloud, 2003; The Family, 2004) or incorporating live neurons (Tree of Knowledge, 2005) or bacteria (Decon, 2007). She is currently the artistic director of Ectopia, an experimental art laboratory in Lisbon, and Director of Cultivamos Cultura in the South of Portugal. Bio: Dalila Honorato, Ph.D, is a facilitator of safe spaces for hosting the interaction of ideas around liminal issues in the frame of Art&Sci. Her research focus is on embodiment, monstrosity, the uncanny and the acrobatic balance between phobia and paraphilia. She is the Assistant Professor in Media Aesthetics and Semiotics at the Ionian University, Greece, guest faculty at Alma Mater Europaea, Slovenia, collaborator at the Center of Philosophy of Sciences, University of Lisbon, Portugal and member of the Steering Committee of the conference “Taboo-Transgressions-Transcendence in Art & Science”.